This is just a short blog to point any interested readers to the interview I recorded with Sean Guillory for his recently launched New Books in Russian Studies. 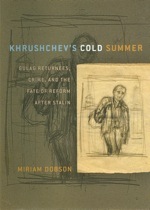 I was pleased that my Khrushchev’s Cold Summer could still count as a new book, even though it was published in 2009. After a break of more than two years since I dispatched the final proofs back to the publisher, it was strange, but enjoyable, to find myself talking in depth about issues which had been the focus of so much attention for so many years.